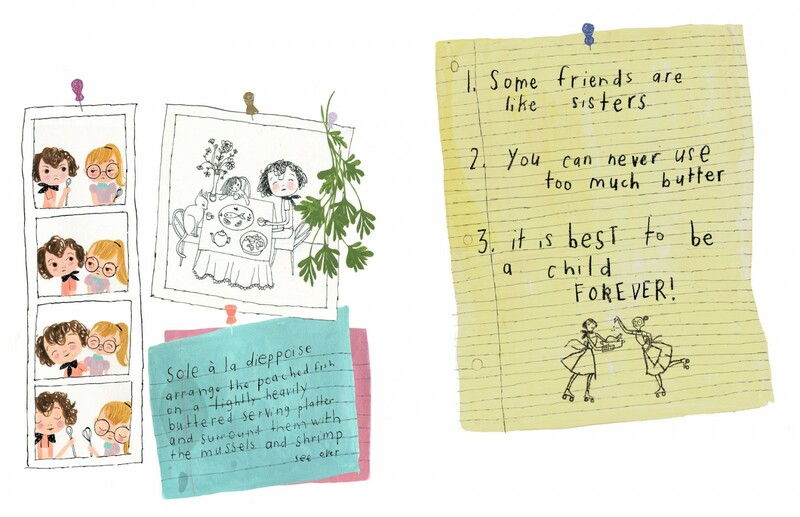 Julia, Child: words by Kyo Maclear, pictures by Julie Morstad. 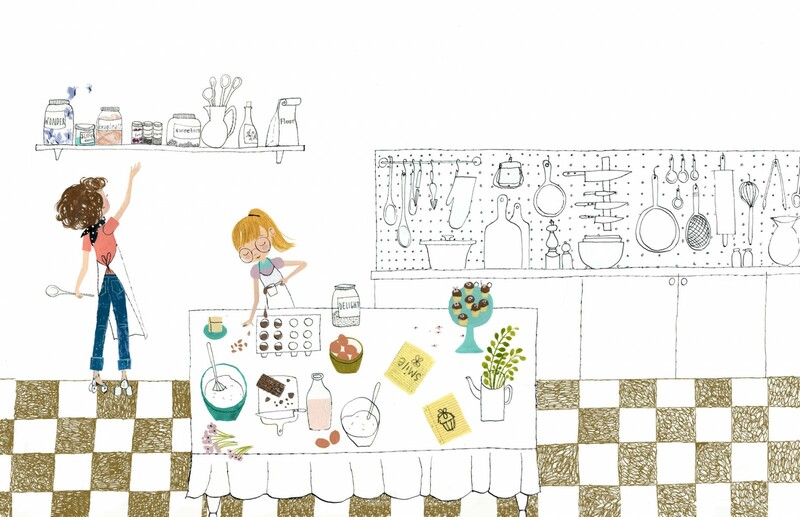 She bears some resemblance to THE Julia Child in her affinity for French cooking and butter, but this picture book is otherwise a fictional tale. Julia has a best friend named Simca. Together, they are experts in friendship and cooking and childhood. Those are the themes of this standout book. The girls are pretty clear on how growing up is not to be desired. They’ve seen grownups. They know they’re “wary and worried, hectic and hurried.” Who would want to be like that? Morstad’s illustrations show adults as line drawings, unfilled out with color the way the children are. They look like people who’ve lost something along the way. So Julie and Simca prepare a meal to bring out wonder in those big, busy people. Through a wonderful meal that draws people to it with its rainbow-like aroma. The dinner has its ups and downs, but dessert is the biggest hit: petits gâteaux—”chocolate almond cupcakes with chocolate butter icing and the richest, creamiest centers.” Small, tasty bites to remind each adult of loveliness, with plenty to go around so they don’t get too greedy or worry about running out. Slow-down, sweetness, wonder, and imagination. These are the ingredients of friendship and cooking and childhood. These are what to cultivate, like Julia and Simca do. and capture something about Julia Child’s spirit. Excerpted from Julia, Child by Kyo Maclear. Text copyright © 2014 by Kyo Maclear, Illustrations copyright © 2014 by Julie Morstad. Reprinted by permission of Tundra Books, a division of Random House of Canada, a Penguin Random House company. All rights reserved. You all know how much I love the baking blog Coco Cake Land, right? 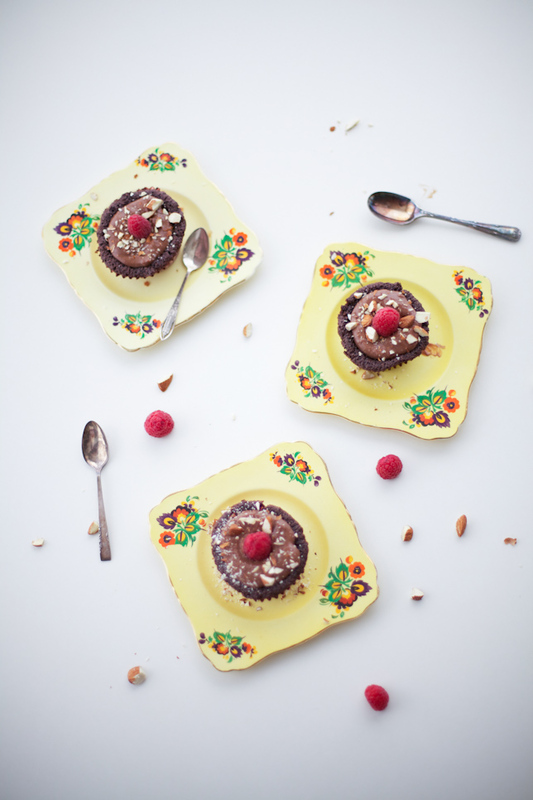 In honor of Julia, Child, Lyndsay is sharing chocolate almond cupcakes inspired by the ones Julia and Simca make in the book!! I’m delighted to collaborate with such a blogging superstar and lovely person! She knows a lot about baking joyfully with plenty of imagination and play! Preheat the oven to 325 degrees F. Gently oil the top of the cupcake pans and line cupcake pans with cupcake liners. In a medium bowl, whisk cocoa powder with the boiling water until you have a smooth, thick and creamy chocolate paste. Whisk in the vanilla extract. In another small bowl, combine the almond meal with the baking soda and salt. Place the sugar, oil and eggs into the bowl of stand mixer with the paddle attachment and beat on high until thick and creamy, about three minutes. With the mixer on low, add the chocolate mixture until combined. Add the almond flour mixture until combined, scraping down the sides of the bowl, about one minute. Using a medium sized ice cream scoop, dole out the cake mixture and fill the cupcake liners just over half full. Bake for 20 minutes – cupcakes will rise, and fall again. Let them cool in the pans. In a small bowl, whisk the egg yolks, sugar, flour and cornstarch. In a saucepan, bring the milk and cream to a low boil. Whisk half of the milk mixture into the egg yolk mixture, then add the egg/milk mixture back into the saucepan with the rest of the milk. Cook the pastry cream over medium heat, whisking constantly until thick – about 3-4 minutes. Remove the pastry cream from the heat and add the chopped chocolate. The chocolate will melt into the hot pastry cream. Whisk to combine. Transfer to a bowl, cover with plastic wrap and power-chill in the freezer for 30 minutes, or let cool in the fridge for 2 hours to set. 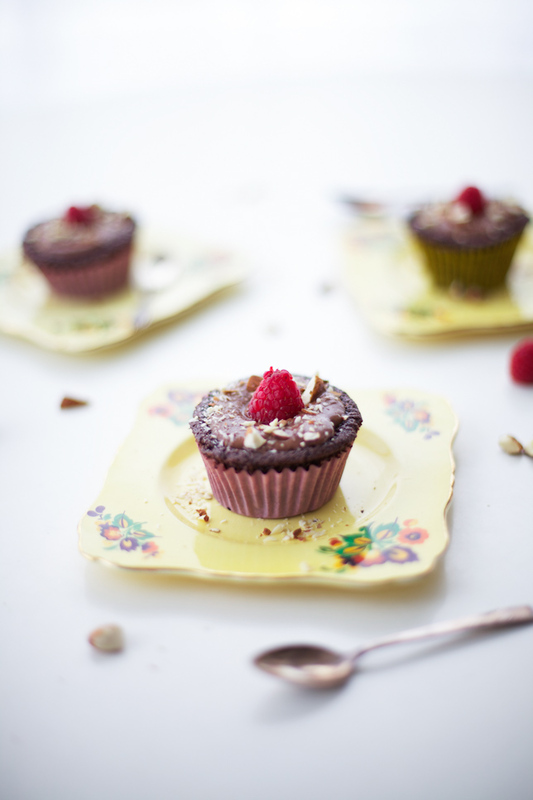 Dollop two tablespoons of chocolate pastry cream into the sunken chocolate almond cupcakes. Sprinkle with toasted almonds and finish with a fresh berry. Place almonds on a baking sheet and bake at 350 degrees for ten minutes (watch they don’t burn!) Let cool until crispy, then chop. Check out the whole post with more photos to admire over at Coco Cake Land! read the book, make full-of-wonder cupcakes! I loved this book! It was so sweet, and gorgeously illustrated. These cupcakes look GOOD. Yay! Me too. Now we need to bake up some cupcakes! This collaboration is so awesome!!! My original career goal was to be a picture book artist, so I’m going to go stalk your site now …. I hope you do stick around! 🙂 Also, your blog is incredible! Clearly you’ve got the skills for that second career! Awww well thank you so much! Drool. Drool. For both the cakes and the illustrations. The illustrations are inspired. What a fantastic idea to show the adults as colorless. A very child-like viewpoint. Brilliant. I don’t know for sure if it was her idea, but either way Julie Morstad is a genius. Her illustrations are cute while being sophisticated at the same time. So excited to try the recipe and I rarely cook (bake more and that’s still not frequent), but this is tantalizing to me. 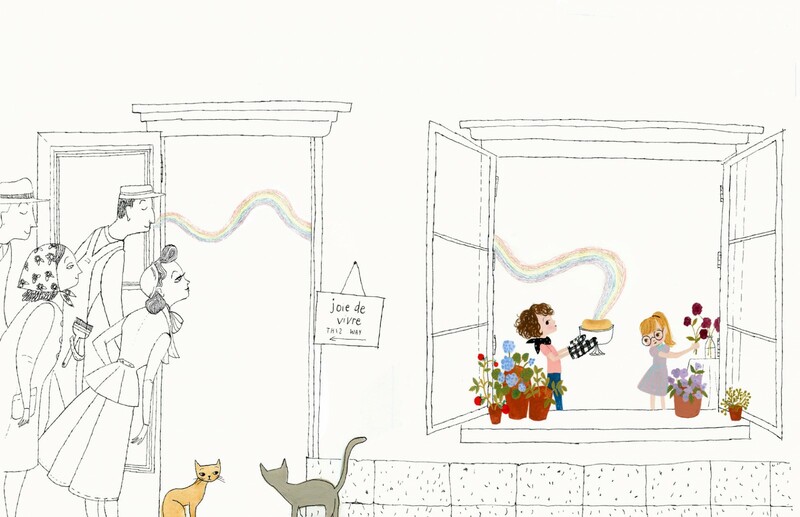 Also, “Morstad’s illustrations show adults as line drawings, unfilled out with color the way the children are. They look like people who’ve lost something along the way.” LOVE HOW YOU GOT THAT. Isn’t fab what an illustrator brings to richen the author’s already awesome text? That kind of seamless, enriching collaboration is the BEST! Hahaha. It’s so up your alley! I think you’ll love it and it matches your joie de vivre quite well!